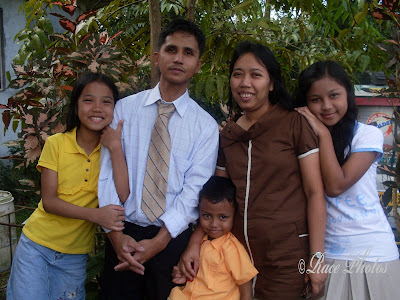 I'm posting here our family picture at our recent December camp meeting in Villa Dominga Forest Resort where we stayed for 4 days and 3 nights. My kids are fast growing up and in a few more months or years my eldest Ruth (to my right) will be taller than me and her daddy. Gen is growing up fast also but still a baby to me. Anyway we'll always have a smaller kid as Josh is only 6 years old now. More years before he grow up and we'll still have his funny antics all the time! We had great moments in our camp fellowship. Visit the kids' pic at the camp here! Thanks for stopping by admiring my clouds. I remember once, you told me you have a passion of the skies and the clouds. Time has been so limited for me to blog and EC drop. Happy New Year, and thanks for the friendship we shared through blogging. More power tobeing a SAHM!